On Sunday, 20 February 2017, the Gaza Military Courts issued 7 death sentences against Palestinian civilians convicted of collaboration with Israel. Three of those sentences were new ones while two sentences were issued by the Military Appeal Court upholding previous sentences. The last two sentences were upheld and ready to be applied after the appeal was rejected by the Military Supreme Court. It should be noted that all sentences issued by the military courts were against civilians. According to the Palestinian Center for Human Rights (PCHR’s) follow-up, the Gaza Permanent Military Court issued 3 death sentences by hanging against A.A.A. (33), KH.M.A. (44), both from Khan Yunis and ‘A.’A.H (65), form Jabalia. Moreover, the Military Court of Appeal upheld 2 death sentences by hanging against W.S.A. (42), from Gaza, and M.B.D (31), from al-Nuseirat. Furthermore, the Military Supreme Court rejected an appeal filed by two convicted persons, ‘A.’A.M (55) and R.H.’A (55), both from Khan Yunis, and upheld the death sentences by hanging issued against them. It should be noted that the two upheld sentences will be implemented following the Palestinian President’s ratification. 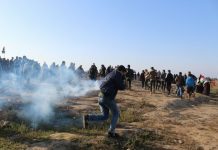 PCHR is gravely concerned over the excessive application of this punishment in the Gaza Strip in light of absence of fair trial guarantees and lack of fragile interrogation techniques. PCHR calls upon the judiciary in Gaza not to issue any death sentence in light of the division and the resulted absence of rule of law and techniques needed to come out with a conviction based on certainty. PCHR refuses that civilians appear before the military judiciary, constituting a flagrant violation of Article 30 of the Palestinian Basic Law (PBL), which stipulates that “Each Palestinian shall have the right to find sanctuary in the legal system.” PCHR also calls upon the Palestinian President not to ratify any death sentence. According to PCHR’s documentation, the number of death sentences issued this year has risen to 11 sentences, 7 of which were new sentences while 4 others were to uphold previous sentences. Thus, the total number of death sentences issued in the Palestinian Authority PA controlled areas has risen to 191 sentences since 1994. 30 of which have been issued in the West Bank and 161 in the Gaza Strip. Among those issued in the Gaza Strip, 103 sentences have been issued since 2007. Since the establishment of the PA, 35 death sentences were issued; 33 of which were in the Gaza Strip and two in the West Bank. Among the sentences issued in the Gaza Strip, 22 were issued since 2007 without the ratification of the Palestinian President in violation of the law, and 3 of which were implemented on 31 May 2016. These were the first death sentences to be implemented without the Palestinian presidential ratification following the formation of the National Unity Government in June 2014. PCHR emphasized that it is extra-judicial execution and constitutes a flagrant violation of the Palestinian Basic Law (PBL) since it requires the ratification of the Palestinian President for implementation. PCHR follows up with deep concern the excessive application of this serious and irreversible punishment. PCHR is also gravely concerned over the continued application of death penalty in the PA controlled areas, and calls upon the Palestinian President to sign the 1989 Second Optional Protocol to the International Covenant on Civil and Political Rights, aiming at the abolition of the death penalty and issue a presidential decree to halt it until the Palestinian Legislative Council (PLC) convenes and abolishes it. PCHR also calls upon the PLC, if convened, to review all legislations related to the death penalty, especially the Penal Law No. 74 (1936) which remains in effect in the Gaza Strip, and the Jordanian Penal Code No. 16 (1960) that is in effect in the West Bank, and enacting a unified penal code that is in line with the spirit of international human rights instruments, especially those pertaining to the abolition of the death penalty. Moreover, PCHR points out that the call for abolition of the death penalty does not reflect tolerance for those convicted of serious crimes, but rather a call for utilizing deterrent penalties that maintain our humanity.